ISLAMABAD: The Bank of Khyber signs Pakistan Telecommunication Company Limited (PTCL) for managed services contract for a period of five years. 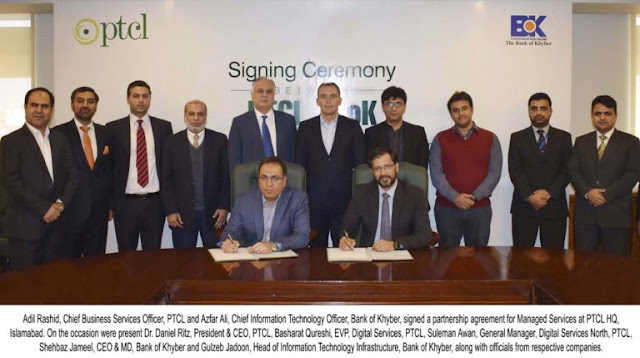 Under this agreement, PTCL will manage and maintain active & passive network operations on behalf of the bank at more than 170 branches countrywide, as well as support the bank in meeting the current and future customer demands.PTCL will also be managing the bank’s overall point to point & point to multipoint connectivity, along with dual media connectivity. The partnership agreement was signed by Adil Rashid, Chief Business Services Officer, PTCL and Azfar Ali, Chief Information Technology Officer, Bank of Khyber. On the occasion, Dr. Daniel Ritz, President & CEO, PTCL, Basharat Qureshi, EVP, Digital Services, PTCL, Suleman Awan, General Manager, Digital Services North, PTCL, Shehbaz Jameel, CEO&MD, Bank of Khyber, and Gulzeb Jadoon, Head of Information Technology Infrastructure, Bank of Khyber, were also present along with officials from respective companies. With more than 15,000 service professionals working across Pakistan, PTCL is the leader in managed services and has the scale required to meet the needs of top businesses countrywide.